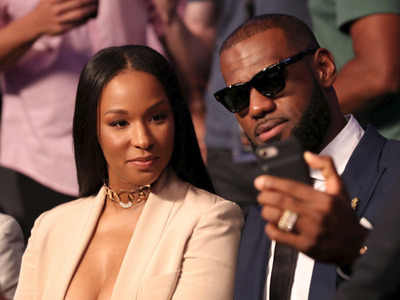 LeBron James and his wife Savannah met in high school and have been together ever since. They became engaged at a star-studded New Year’s Eve bash in 2011, and tied the knot in 2013. The couple has three children, and James is the one of the highest-paid athletes in the world. In 2013, LeBron James married his longtime girlfriend Savannah Brinson. Their lavish wedding included a performance of “Crazy in Love” from Beyonce and Jay-Z, according to Deadspin. The three days of festivities also featured plenty of celebrity cameos, from family friend and fellow NBA star Dwayne Wade to singer Neyo, wrote The Hollywood Reporter. The couple started off as high school sweethearts, who grabbed dinner at Outback Steakhouse on their first date and stuck together through James’ meteoric rise through the NBA. Today, they have three children and two sprawling mansions: a $US21 million mansion in Los Angeles, and a $US9.2 million one in Akron, Ohio. The three-time NBA champion is worth $US275 million as of 2016 and is one of the highest-paid athletes in the world, according to Forbes. James and Savannah both grew up in Akron, Ohio and attended rival high schools. He was a sports prodigy, excelling at basketball and football. She was a cheerleader and softball player. For their first date, the high schoolers went to Outback Steakhouse. Savannah forgot her leftovers in his car afterwards, and James returned them to her. “I think he just wanted another excuse to come and see me,” she told Harper’s Bazaar. The pair now have three children: LeBron Jr., Bryce Maximus, and Zhuri. James said he’s apologised to his wife for some of the chaos that comes with his quest to be an NBA star and leave an unforgettable athletic legacy. James proposed to Savannah on New Year’s Eve 2011, at a party that doubled as his 27th birthday bash at the Shelborne South Beach Hotel in Miami. Dwayne Wade apparently held onto the $US300,000 ring. James compared the nerves around proposing to his longtime girlfriend to playing in “a finals game.” Savannah said yes. Two years later, the two wed in San Diego. “When u have someone that’s always there for you no matter the ups and downs in life, it makes it all worth living for! So happy to call u Mrs. Savannah James #MyQueen #Backbone #QueenJames #Honeymoon,” James wrote in an Instagram post. The next year, James threw a surprise 30th birthday bash for his wife. The theme was Miami Vice, one of Savannah’s favourite television shows — and her husband bought her a Ferrari Testarossa, the type of car used in the show. The couple also spends time giving back to the community. Savannah founded the “I PROMise Makeover,” an annual event providing underprivileged teens with prom dresses. The LeBron James Family Foundation has also donated $US41 million of scholarship money to University of Akron students. Now check out how they spend their money.